and transferred to Protea Hotel - Entebbe and be briefed about your safari. Balance of the day spent at leisure with lunch and dinner under own arrangements. Protea Hotel Entebbe is a new hotel, conveniently located 1km away from Entebbe international airport and on the shores of Lake Victoria. This hotel has a total of 73 guest rooms, including 14 suites. All rooms are spacious and with en suite bathrooms and all modern amenities The Tides Restaurant, Terrace, and Bar serves full breakfast, lunch and dinner. Meet your driver in the lobby at 6:00am and be transferred to Entebbe airport to check in for your morning scheduled flight to Kasese airstrip which departs at 7:00am. Upon arrival at the airstrip you will meet your driver/guide and be transferred to Ndali lodge. In the afternoon, you will have the opportunity to visit the crater lakes. Ndali Lodge is perched on the rim of an extinct volcano which, since its demise, has filled with water to become the breathtaking Lake Nyinambuga – 250 acres in size and 130 meters deep. There is a main thatched lodge with a spacious sitting room, reception area and dining room flanked by 8 cottages providing luxurious accommodation for 16 guests. The cottages face west offering a panoramic view of the spectacular 'Mountains of the Moon' and are built of local stone and thatch. The interiors are imaginatively and comfortably furnished where the decor emphasis is on the use local materials. Each cottage, large enough to accommodate a family, has en-suite facilities with bath, shower, WC with hand basin and a private verandah, perfect for watching the sun setting behind the Rwenzori mountains. At 6:30am, meet your guide in the lobby and transfer to Kibale National park and drive to Kanyanchu Park Headquarters for a briefing of the chimpanzee tracking. Later, enter the forest to search for man’s closest friend. These delightful apes, more closely related to humans than to any other living creature, are tremendous fun to watch as they squabble and play in fruiting trees. The incredibly diverse forest is home to over 13 species of primates including red Colobus monkey, the rare L’Hoest, blue monkey, grey mangabey, black faced vervet monkeys, baboons and also bush babies swinging through the dense forests, with your informative guide making it even more interesting by pointing out other forest features, flora & fauna. Upon sighting the chimpanzees, you stay with them for 1 hour as they go about their daily life! Later transfer to the lodge for lunch. In the afternoon go for Bigodi swamp walk. Have your morning breakfast served at 7:30am before transferring to Queen Elizabeth National Park. On arrival, check in at Kyambura Gorge Lodge. Queen Elizabeth National Park (QENP), located in western Uganda, is Uganda’s most popular savannah park. The park comprises of 1,978 sq. km of open savannah, rainforest, dense papyrus swamps and brooding crater lakes which extend from Lake George in the northeast to Lake Edward in the southwest and includes Maramagambo Forest and Kazinga Channel connecting the 2 lakes. QENP is home to an incredible array of wildlife including almost 100 species of mammals and over 600 bird species. Much of the best game viewing is in the northern Mweya Peninsula area which boasts a marvelous waterfront setting in the shadow of the Rwenzoris. The southern area of Ishasha exiting towards Bwindi is famous for its tree-climbing lions, whose males sport black manes, a feature unique to lions in this area. Kyambura Gorge Lodge is an ideal location for Uganda safari activities including chimpanzee trekking, wetland tours, lion safaris, the African primate safari, and much more. Kyambura Gorge Lodge boasts incredible views overlooking the Queen Elizabeth National Park, with the mythical Mountains of the Moon in the far distance. The main lodge building was originally a coffee store and processing plant, surrounded by coffee plantations. The original structure has been sensitively restored to create a stunning and contemporary living space, balancing the history of the building with a series of distinct luxurious spaces for guests to relax. The beautiful bandas have each been nestled into the hillside with their luxury comforts including en-suite bathrooms and an individual view of the park. After lunch, brace yourself for a unique 2 hrs scheduled boat cruise on the Kazinga channel that joins Lake Edward to Lake George and also famous for the highest concentration of hippos in Africa. You may also encounter crocodiles, countless of birds on the shore and overhead and in the water of the channel. This is a pleasant boat ride where you can get some great pictures of elephants and buffaloes on shore. Hopefully an open mouthed hippo shot. Have your morning breakfast served at 7:30am before transferring to the Ishasha sector for a game drive as you make your way to the lodge, arriving in time for lunch at Ishasha Wilderness camp. Ishasha wilderness camp is situated inside the Ishasha sector of Queen Elizabeth national park on the Ntungwe river, and is an Idyllic retreat for people who truly enjoy the wilderness, it is the only exclusive camp in Ishasha Sector. On a clear day one can see the virunga volcanoes to the south, and the Ruwenzori Mountains to the North. Guest accommodation is in 10 tents, each spacious tent, which overlooks the pretty Ntungwe River, has 2 large beds, shady verandah and has its own en suite bathroom and dressing area, providing hot water bush showers and an eco-friendly flush toilet, power is provided by solar energy. Enjoy a late afternoon game drive down to the Lake Edward floodplains and hopefully you might see an occasional leopard and spot more tree climbing lions. In the evening enjoy sundowners beside the river which offers al fresco dining and an evening 'fireplace' for guests to relax and share their day's experience. After your morning breakfast at 7:30am, transfer to Bwindi Impenetrable National park for check in at Gorilla Forest camp. Bwindi Impenetrable Forest National Park’s 331 sq. kms of montane and lowland forest jungle lies in southwestern Uganda. A UNESCO World Heritage Site and accessible only on foot, it is one of the richest ecosystems in Africa providing habitat for over 90 mammals (including 11 primates), 346 species of birds (including 23 highly localized Albertine Rift endemics), 202 species of butterflies, 163 tree species, over 100 species of ferns, 27 species of frogs, chameleons, geckos and other endangered species. Bwindi is most notable for her 340 Mountain Gorillas, about half the world's population of this critically endangered primate. Activities include: Gorilla tracking, Forest walks, Cultural visits with the Batwa people and unbelievable bird watching. Gorilla Forest Camp is a permanent luxury tented camp situated in the misty rainforests in the heart of Bwindi Impenetrable Forest National Park. Guest accommodation comprises 8 Double Tents, all raised on wooden platforms with en-suite facilities - hot and cold running water, WC, basin and a bathtub looking out onto the beautiful forest. Each tent also has a spacious wooden verandah where guests can relax, enjoy a private meal and absorb the exotic mystery of the surrounding rainforest. Other amenities include a bar and dinning cottage as well as 240v electricity supplied for lighting and recharging videos, laptops and telephones. unforgettable experience! After an early breakfast, transfer to the park HQ for a pre-Gorilla tracking briefing and information about the gorilla family you will track. At 08:00 AM, set off into the forest in the footsteps of the Mountain Gorillas. 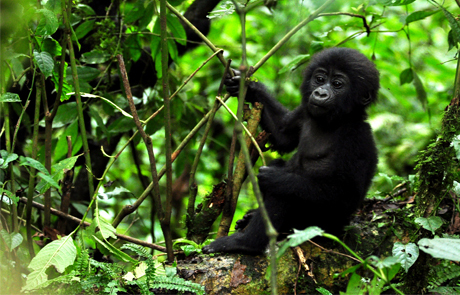 You will be led by experienced gorilla trackers on the slopes of the volcanoes. You will start from the site where the gorillas were encountered the day before and from here the gorilla tracking begins. It is a humbling experience to stand just meters from man’s distant cousins as they eat rest, play and bond with their young. Follow the mountain gorillas as they range freely in the impenetrable forest, and discover their gorgeous natural habitual and the many species they share it with. You are allowed an hour with the gorillas. The trekking can take from 1 to 5 hours but sometimes it might take long hours. The terrain is rough and at times muddy. Although the hike is physically demanding the beauty of the forest and surrounding scenery make the trekking worthwhile. Once the gorillas are located all fatigue is forgotten, as the experience is often described as being the most profound natural history experience in the world. Cameras and plenty of fast speed film is recommended. It can rain at a few minutes’ notice; hence waterproof clothing is a good essential including zip lock bags for cameras and film. It is important to take plenty of water. After breakfast at 7:30am, drive heading for Lake Mburo National Park. This is one of the smallest parks in Uganda, underlain by ancient Precambrian metamorphic rocks which date back more than 500 million years. It offers a great variety of wildlife including zebra, leopard, various antelope and hippo – as well as prolific birdlife. The wildlife-rich eastern banks of Lake Mburo can be explored during a tranquil two-hour boat voyage in the afternoon. Together with 13 other lakes in the area, Lake Mburo forms part of a 50km-long wetland system linked by a swamp. Five of these lakes lie within the park’s borders. Once covered by open savanna, Lake Mburo National Park now contains much woodland as there are no elephants to tame the vegetation. Check in at Mihingo Lodge. Mihingo Lodge is a peaceful and exclusive retreat adjacent to Lake Mburo National Park. It features ten tented rooms built on a wooden platform with stilts and covered by a thatched roof. Each luxury tented room is nestled on a private piece of the lodge’s property, enabling guests to enjoy the tranquil environment in complete seclusion - some rooms are situated in a forest setting, some with a lake view, and some on rocky outcrops. All rooms have a great view. From the dining room and pool area, guests can enjoy the view of a westward oriented valley and its stunning evening sunsets over the lake and park. Animals gathering in the valley will provide guests with fantastic game viewing opportunities or a chance to relax and watch wildlife at the water hole below the pool. In the afternoon go for a boat cruise on the Lake. Keep an eye out for crocodiles, buffaloes and hippos as well as colorful Kingfishers, magnificent Fish Eagles, Hammer kops and their enormous nests and even the prehistoric-looking Shoebill. After your breakfast, check out and go for morning guided safari walk. This is one of the most alluring and unique activities in Lake Mburo National Park because you are permitted to walk anywhere in the park in the company of an armed park ranger. This gives tourists the unique chance to get out and about and absorb the wonders of the African bush without the confines of a vehicle. Later be transferred to Entebbe with a stopover at the Equator where you will have an opportunity to stand in 2 hemispheres at the same time and take some photos. Time allowing, you may have another stop over at the Mpigi Royal Drum Makers where you will be able to watch the ceremonial drums being crafted using methods passed down through the generations. Continue on and arrive in time for your evening international flight. · Items of a personal nature, such as laundry, telephone calls, room service, beverages, personal purchases, optional extra activities, etc. · Gratuities to tour guides, drivers and restaurant staff for services rendered. · Any other services not specified above. · Compulsory Travelers insurance and cancellation protection. · This quotation is subject to the availability of all services at the time of making a reservation. · Travel insurance coverage for injury, illness or loss of effects while on tour is NOT included, is highly recommended for travel and compulsory for many lodges and adventure safaris in Southern and Eastern Africa. · Registration: A 25% deposit of the total land price, per person is required. The remainder of the cost is due 75 days prior to departure date. Airline tickets must be purchased within two weeks of reservation confirmation. · Payment is accepted by personal check, company check or credit card.